When The Rider opened his eyes he saw nothing but the endless ocean that once existed. He saw the churning waves create frothing whitecaps that would rise and fall in an almost rhythmic fashion as if the sea itself was breathing. He saw the setting sun’s reflection on the crystal waters, its elongated orange-yellow lines dancing across the surface as if they were painting a path of gold for him to follow; but none of this existed anymore. In another time, maybe too long ago for even the earth to remember, this might have been but the ocean had dried and the sun never faltered only stood frozen in its highest point never setting nor rising; a land where time does not exist, on a sea where there is no end. A thick blanket of heat covered the dry land where no grass dared to grow and any drop of water quickly disappeared being consumed greedily by the dying earth. The land had no name or at least no name that The Rider knew of, this was where men and their dreams came to die; an endless purgatory of un-quenchable thirst and sweat-less heat. When left alone with nothing but their thoughts men will drift to darker places, places where the mistakes of the past fill the present mind, where forgotten regrets are remembered. The Rider knew that this was only his darkness talking, his now ever present anger, fear and cowardice. It was loudest when he was at his weakest, whispering words that break the spirit and drive sane men to inflict harm on themselves and others, words that put forth the notion to think it easier to be dead than alone. But The Rider was not alone. Asta continued his steady pace while the rider stayed down, his chest down against the horse’s back while his naked back faced the scorching sun, burning over and over again removing all moisture from his skin. In The Rider’s stupor he thoughtlessly stroked Asta’s dark brown coat while he faintly sung the melody to a title-less song through his calloused lips. Off in the distance the rider heard the faintest cry, almost too small to be real. He sat up exposing his cool stomach to the mid-day sun, while the last of the dry dead skin fell in flakes off his back. Looking forward towards the cry he saw only what he’d seen for the last three days; emptiness, an endless emptiness that could only be described as infinite. It was a never ending void where nothing could live or exist; a sunbathed black hole of sadness and death, fear and pain, where the ordered intermingling of the real and of the dream we indistinguishable as days became weeks, became months; this is where we would die. And somehow he was comforted. The Rider remembered when the Reverend died. Hanging from the end of a rope, rocks being thrown at his lifeless body by the children of the town, swinging effortlessly with each heavy hit, his eyes out of their sockets, he remembered it was the last time he thought about God. Although he knew what night was he couldn’t remember a time when the sun wasn’t in the sky. It had been over three days and The Rider continued on Asta’s back drifting between awake and sleep. Every once in a while he would wake and look off into the distance and listen intently hoping to hear the small cry again, but he never did. He had no more food or water and thought more and more of killing Asta. Drinking his blood and eating his meat would satisfy his hunger for a short time but he knew it would only tempt his thirst more as he had nearly forgotten the feel of liquid on his tongue. Long ago he removed his shirt and tied it under the saddle, for the little difference the shirt made in the heat of the sun was well worth the burns. Often he would wake up and find himself chewing out whatever liquid there was left in his hair but that only lead to dry heaving, vomiting with nothing of substance to throw-up but dried stomach acid. His lips were cracked and dried beyond repair and when he moved his mouth or smiled new cracks would rip into his once soft lips exposing his thick blood underneath. The small amount of moisture his blood provided was a welcomed feeling to his tongue which licked the liquid off his lips greedily. A single drop fell from his chin to his bare chest and evaporated on contact, he smiled through blood filled teeth at the thought of this, as if his skin were as dry as the ocean they rode upon. There was very little left that he could do and the rider knew this. There had been many times he had thought about just killing himself but knew for some reason he would not be allowed to leave that easily. Between sleeping and being awake he would often have images flicker through his mind like the flames of a candle being blown by the wind; frozen moments in his childhood that shaped him and hurt him in a way no one would ever know. The first time he found his father’s knife and the scar that it left under his left eye, the wooden planks that came loose on the back fence during the winter and had to be nailed back come spring. The way the trees would sway during heavy rain storms, the wind so strong that he was almost certain they’d be ripped from the ground along with their roots leaving enormous holes to the centre of the earth. The last time he saw his mother. The image stirred him from a dream and he sat up on Asta’s back. Off to the side twinkled a spark of light, like the sun catching the silver of a fishing hook, he turned Asta in the direction of the glimmer. To the East was a single tree, a lone pillar in a dead sea, the rider grabbed the reigns and began to ride towards it. He could almost see it in the distance, a single lone patch of shade that the sun could not find. As he approached he saw that there was something in the patch, at first what looked to be a misshapen rock, deformed and morbid with a face carved in it, but as he rode up saw that it was not a rock but rather the body of a young man hunched over. The man, although one could hardly call him that, was in his early twenties. The rider slowed down Asta and wearily sank off onto his feet, nearly collapsing before grabbing hold of the reigns to stop from keeling over. He had not put weight on his feet in days and the sudden rush of blood from his upper body left him dizzy and sick, but he maintained his posture. To the right of the boy’s body was a small patch of reflection which at first the Rider believed to be broken glass, but quickly realized was smaller puddles of murky water. He greedily lunged towards it and although his tongue was barely wet with the small amount of liquid within the puddle he smiled happily at his small fortune. The man stirred and the rider nearly fell back. “Help.” The dying man said hopelessly. The rider looked at him with vague recollection a long since forgotten memory, or perhaps in a future that should have been. “The past and future have more in common than you would think,” his mother had told him once but he thought little of her anymore. He was Mexican by the look of his facial hair and coloured skin, but it was tough to tell as the sun erases all signs of colour eventually. He looked like he had a past of violence from the scars on his face, chin and neck his presence and the way we spoke told The Rider the wreaked of war. Perhaps this was where he was meant to end up, dying beneath the shade of this tree, the rider thought, but quickly brushed the thought off. The rider went back to his half empty puddle, the brown colour of the water reflected his face so that he could see neither his eyes nor his nose, only his lips and teeth; which to his surprise were smiling. “Please.” The man began to cry weakly as if he were a child asking for a treat. The man tilted his head back, tears streaming down his face. He spoke silently to himself and the sky, of things the Rider could not hear nor care for. After a long pause the man turned to the rider and as if in a confessional spoke. The man sobbing heavily lifted his shirt with one hand revealing his bullet wound; he was shot through the stomach. The rider suddenly realised that the man was holding a gun at his side hidden from view and he pointed the gun at the rider. “Please.” The man said through choking tears. Without averting his gaze from the water the rider responded to the man’s threat. “You have nothing to threaten me with.” The man cried. 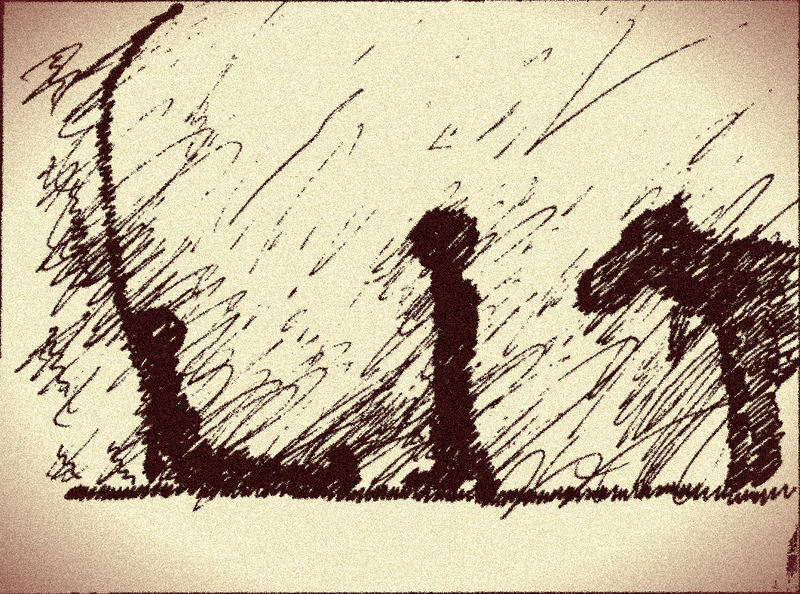 The rider stood up from the puddle painfully and faced the man sitting up under the shade of the tree. The man lowered his pistol. The rider walked towards Asta ready to mount when the man stopped him. The rider eyed the pistol, it was a beautiful weapon much like one he carried years ago, an ivory handle and bright silver finish made the gun shine. The rider began to shake his head slowly. The rider stood for a long while staring the young man down, he saw the fear in his eyes, and after a moment felt like he remembered the boy. The rider sat in the shade across from the man his gaze on the pistol. The man took heavy and slow breaths as if he were winded from a long run and every so often the soft sound of blood popped in his exhale. The man looked like a thousand souls the rider had known, a compilation of every face he knew formed together in this young man. He sat for a long time remembering the past, and was suddenly reminded of the first man he killed, lying dead in the street, blood pooling around the exit wound out the small of his neck. He was so young then, naïve and short tempered. Had the situation arisen now he surely would have lived, the rider had grown wiser in the ways of the world, he believed. He would have let that man walk away, he would have told him he was drunk and too loud, he would have knocked some sense into him, but he would not have killed him, would he? After a short while the man began to drift off but never fell asleep. The rider never moved only continued his eyeing of the pistol; it was so familiar to him. Eventually the man spoke. The rider looked up to the sky. The man whimpered and bit his lower lip. The Rider took a long slow breath and picked at the dirt as he spoke. The rider looks at the man and then the tree. The rider stood up looking down at the man which from the angle looked more like a boy than he had thought before. Then the man stood as well, the two faced each other and with his gun at his side the man began to cry. “Son; tyrants will rule, good men will be forgotten, monsters will come into power, cities will crumble, towers will be erected, oceans will dry and skies will fall. At the end of it all do you know where you will be? The rider mounted Asta, and rode East.